The demand of cement in Sri Lanka is growing fast due to the rapid development in the services, tourism, and construction sectors. The Puttalam cement factory, owned by the Swiss company Holcim Group, is the biggest one in Sri Lanka and is located in the Palaviya G.S. division, just 8 km from Puttalam town. The local population claims that cement dust poses a health hazard to them and that is the reason why, especially during the 2001-2005 period, they rose up with several protests . The site consists of a dry process cement plant with two kilns and it is approved to co-process alternative fuels and raw materials (AFR), including hazardous and non-hazardous wastes. Limestone and other raw materials for the cement operations are transported by rail from dolomite mining at Aruwakalu (owned by the cement plant itself) and clay from Vanataha Villu. It is reported that 850,000 tones of limestone are mined every year just for this purpose . The limestone quarry at Aruvkalu is now strip mined with the overburden pushed into the Dutch Bay thus destroying the most valuable prawn fishing area in Sri Lanka. When the IUCN (International Union for Conservation of Nature) requested permission to enter this quarry site Holcim refused it. Accordingly no proper environmental assessment related to this mining operation could be done . The primary kiln fuel is coal imported from Indonesia. However, AFR co-processing now currently provides up to 20% of the kiln fuel, primarily from non-hazardous wastes including biomass and textile scraps . All AFR co-processing related operations at the facility are handled by Geocycle, a brand of the business units in the Holcim Group companies active in waste management. To date, the facility has primarily co-processed biomass wastes (rice husks and sawdust) and textile scraps, but has also processed petroleum sludge, waste oil, and expired pharmaceuticals . The facility also accepts (since October 2008) a wide range of hazardous wastes for co-incineration. The processes of cement production, which comprise mining, pulverizing, grinding, and clinkering, generate air dust particulates, fumes, and gases consisting of Nitrous Oxide (NO), Nitrogen Dioxide (NO2 ), Sulfur Dioxide (SO2 ) and Carbon Monoxide CO. These emissions degrade the air quality in areas within 3-4 km radius periphery of the factory. Such emissions can contribute to a wide range of health effects, especially respiratory diseases, brain damage, lung cancer, heart diseases, skin irritations, fatigue, headache, and nausea. Failing eyesight due to fumes is also common in the operational area of the factory. According to the World Health Organization (WHO), long-term exposure to the above emissions can result in many diseases . Moreover, it stands to reasons that environmental and related socio-economic and health impacts are not due only to the cement production itself but also to the co-processing. A study conducted by the South Asian Network for Development and Environmental Economics (SANDEE) in 2008  gave evidences that air pollution from the Puttalam cement production plant is affecting the health of people who live close to it. The study found out that about 14% of the people who live in the vicinity of the factory have respiratory illnesses linked to the pollution that it produces. Air pollution results show that the pollution levels around the plants are of concern when compared to WHO standards. The most worrying pollution findings are the SPM (Suspended Particulate Matter) levels that were found to be significantly higher than WHO standards in the wet season. This is significant because the SPM, that is released during the cement manufacturing process, remains in the atmosphere because of its low settling velocity. It can penetrate deeply into the respiratory system and cause upper and lower respiratory illnesses to humans. The study of people’s health found that bronchitis, pleurisy, high blood pressure, and heart trouble were all significant problems. Nearly 15 % of individuals had suffered from these diseases during the previous year. An assessment of symptoms and illnesses showed that nearly 10 % of the people in the study area suffered shortness of breath, 11% cough/ phlegm, 1.3% Asthma and 0.8% heart problems. Susceptibility to respiratory illness seemed to be highest in the wet season, probably due to higher SPM levels . However, not only residents around the factory are facing health problems. According to the Centre for Environmental Justice , the dust causes respiratory related health problems also to people living along the path of the dust, during both north east and south west monsoons. Moreover, among the alternative fuels and raw materials (AFR) co-processed by Holcim cement plant there are the fly ash from Norochcholai power plant (see related conflict). For this reason heap of ash are accumulated at the coal plant waiting to be transported to the cement factory. In 2014 organic farm owners and farmers living in the area nearby the coal plant complained that the ash, which can cointain amounts of arsenic, lead, mercury, chromium and dioxides, have being blown by the monsoon winds towards settlements, affecting plantations and causing respiratory problems . The Holcim cement factory is not open to criticism only for the emissions and the following impact on workers and local population. 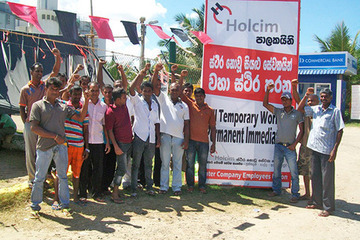 In May-June 2014 Holcim workers and their families, supported by The Inter Company Employees Union (ICEU), have carried on demonstrations, strikes and factory occupations claiming job permanency, better wages and improved working conditions. Workers in the production and transport sections are employed on a 12 hour shift system. Their basic monthly wage is less than US$115. In the loading section, six workers have to load 4500 cement bags during a 12 hour shift with the assistance of a conveyor belt. The workers on 'general duties' work nine hour shifts and are on daily wages of US$16.02 . The Ceylon Electricity Board (CEB) Additional General Manager (Generation) M. C. Wickremasekera declared that the mentioned accumulation of ash heaps at Norochcholai coal plant was caused by the workers strike. However, following the statements by Hemantha Withanage from Centre for Environmental Justice, this is an indication that the pollution mitigation strategies have not been followed . The Sri Lanka total production of cement is unable to meet the local demand. For this reason Sri Lanka imports cement from abroad (especially from India). Moreover the government has called for offers to construct a new cement plant at Kankasenturai in Jaffna and Holcim itself is planning to expand its producing capacity in Sri Lanka. 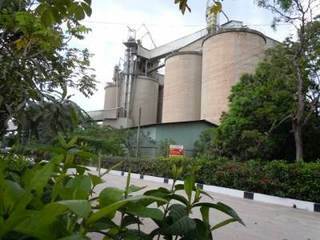 Project Details The Puttalam cement factory, which is the bigger of the two functioning factories, produces 80% of Sri Lanka’s production of 542,000 MT. Holcim Lanka sold approximately 1.39 million tons of cement in 2013. Holcim Lanka generated annual revenues of approximately LKR 19.7 billion (152.7 million USD) in 2013. Every year 850000 tones of limestone are mined for Hocim cement factory . South Asian Network for Development and Environmental Economics (SANDEE). C. Bogahawatte, J. Herath. Air Quality and Cement Production: Examining the Implications of Point Source Pollution in Sri Lanka. Newspaper article from 'the Sunday Times' on line (22/6/2014). Monsoon blows foul emissions landward, covering crops, houses with ash.